MegaVoice International Board Member, has gone on to be with the Lord. 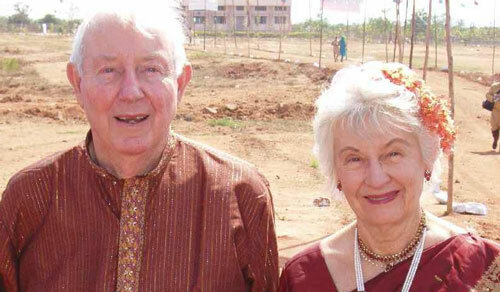 Galcom co-founder Harold Kent (shown above with wife JoAnn on one of their many mission trips to India) died peacefully at his residence on January 23, 2014 at age 89 following a long illness. His 25 year-long faithfulness and dedication to the mission and vision of Galcom International have largely resulted in more than 10,000,000 people around the world hearing the Good News of Jesus Christ through durable solar powered fix-tuned radios and audio Bibles. Known for his vibrant faith in Christ, his wise counsel, his love of life, love of family, generous nature and good humor, he will be greatly missed. Memorial gifts in his honor will be used to continue his legacy of generously supporting Galcom’s global outreach and may be made by clicking here.